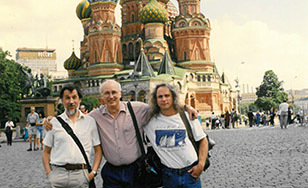 Tom Morgan, center, with Vladimir (Volodya) Prozorov, left, and teaching assistant Richie Townsend in 1998. On the shores of a vast glacial lake lies a charming city with a thriving arts, educational and cultural scene, and residents whose friendliness warms up its long, cold winters. With an abundance of natural beauty from its thick forests to the sparkling waters alongside its lakewalk, its economic roots are in mining and shipping. If you're picturing Duluth, shift your coordinates about 4,500 miles to Petrozavodsk, Russia. With so much in common, it only makes sense that the two communities are sister cities. Since 1986, Duluth Sister Cities International has been building global understanding through cultural exchange. Enhancing that relationship is the student exchange partnership between St. Scholastica and Petrozavodsk State University, which celebrated its 25th anniversary in 2014. In alternating years, visits are held in Russia for American students and at St. Scholastica for Russians. For many of the hundreds of students involved, the experience has proved life-changing. "My experiences formed the course of my life for years after and still today," said Ryan Walker, who first traveled to Petrozavodsk in 1998 with Tom Morgan. Morgan is an associate professor of Global, Cultural and Language Studies and director of the College's Alworth Center for the Study of Peace and Justice. He was the driving force behind the exchange, with help from his Russian counterparts. Walker is now in graduate school studying Russian literature at Morgan's alma mater, The Ohio State University. He spent years involved with various aspects of the exchange program and taught conversational English for two years in Petrozavodsk. For others, the exchange has led to love. Susha Olson, a Petrozavodsk State University student from Russia, came to Duluth in 2007. Not only did she fall in love with the culture and scenery of northern Minnesota, but she fell for a St. Scholastica graduate and exchange program volunteer named Jeramie. They met at a pig roast, spent several months keeping in touch on Skype, and were engaged by the end of the year. Two children and many happy years later, Olson is now the manager of St. Scholastica's Saints Shop on campus. Grant Hendrickson leapt at the chance to take part in the exchange program, first in 2000 and again in 2002. "For each person it's different," he said. "There's a dynamic quality to it. It can change each person in a different kind of way." He met his future wife and got married while teaching in Russia. Now a social studies teacher at Minnetonka High School, he and his wife are raising two bilingual daughters, and try to visit Russia every even-numbered year. Hendrickson coordinates the Russia and Serbia components of the Minnetonka High School International Studies and Exchange program, and runs the Russian Club. "What Tom Morgan built and developed is really an incredible thing," Hendrickson said. "So many people's lives, both American and Russian, have been influenced in so many positive ways by what he's done." Morgan called the exchange "genuine peacemaking at the grassroots level." "Helping to create and operate this Russian-American exchange program has been one of the most rewarding things I've ever been involved in," he said. "I always acknowledge the contribution of Vladimir (Volodya) Prozorov, my Russian counterpart and co-founder of these exchanges. Without his courage, insight and zeal in those early years, this relationship never would have gotten off the ground, much less flowered." The exchange continues to flourish as it begins its second quarter-century, now under the direction of Karen Rosenflanz, an assistant professor of Global, Cultural and Language Studies. Meanwhile, social work professionals from both cities have started a partnership as well. Social work educators and professionals from Duluth and Petrozavodsk met last fall to share best practices. In October, a delegation traveled to Petrozavodsk as part of the U.S. State Department's grant-funded U.S.-Russia Peer-to-Peer Dialogue initiative. Michelle Robertson, St. Scholastica social work program field director, was part of the group, along with faculty members from the University of Minnesota-Duluth and the University of Wisconsin-Superior. "We may have addressed certain things before they have," Robertson said of her Russian counterparts, "but they have addressed some things better than we have. It's just so great that this is a dialogue." A social work delegation from Petrozavodsk visited Duluth in November. Their nine-day itinerary included discussions with local professionals on universal issues such as child abuse, gender-based violence and fetal alcohol spectrum disorders. The visit was sponsored by Duluth Sister Cities International. The peer-to-peer dialogue program also includes a series of video teleconferences between the delegations and student exchanges later this spring. For more information on study abroad at St. Scholastica, visit their web page or blog.